Preheat oven to 325 ̊F and line muffin tins. In a bowl, mix together the flour, salt, baking soda, and baking powder. Set aside. Mix the sugar and eggs until combined. Add in the oil and mix until combined. Add in the vanilla and orange juice and mix until combined. Add in the Apple Pear and mix. Stir in the flour mixture until combined, then fold in the orange zest. 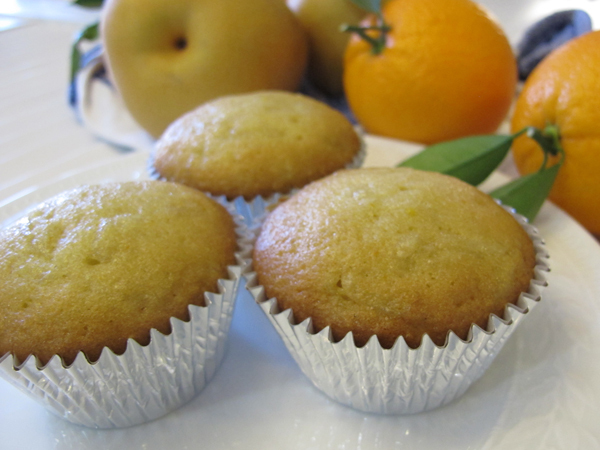 Fill muffin tins to 2⁄3 of the way full (about 1⁄4 cup each for full size muffins or 1 Tbsp for mini-muffins) and bake for 25-30 minutes for full size muffins or 15-20 minutes for mini-muffins. You can insert a toothpick to check for doneness - it will come out clean when done. Makes approximately 24 muffins or 48 mini muffins.